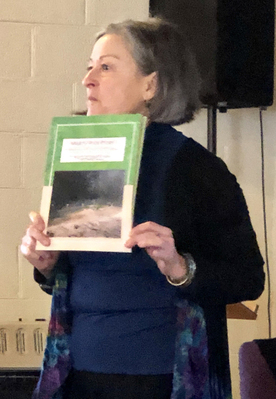 Clifton Forge, VA (Feb. 5, 2019) - For the February Woman’s Club meeting, local author, Joan Vannorsdall spoke about the “What’s Your Story?” organization of which she is project director. The “What’s Your Story?” committee has just completed the fourth book in a series of books which tell stories of the Alleghany Highlands. The committee members interview local residents, collect their stories and compile them in a book about specific topics. The first book told stories of The Historic Masonic Theatre, the second book told stories of the C&O Railroad, the third book told stories of Green Pastures Recreational Park and the fourth book to be released soon tells stories of Dabney S. Lancaster Community College. All work in writing and editing the books is done by a committee of volunteers. Ms. Vannorsdall writes a regular column for Blue Ridge Country magazine and travels to the eight states that the magazine represents to gather stories for her column. She has just returned from Jonesborough, Tennessee where the International Story Telling Center is located. They present a yearly Story Telling Festival and the town is transformed. Ms. Vannorsdall told Woman’s Club members that communities are realizing the power of storytelling. “The possibilities are endless when we rely on the art of storytelling.” Through “What’s Your Story?” the committee hopes to bring that philosophy and its benefits to the Alleghany Highlands. 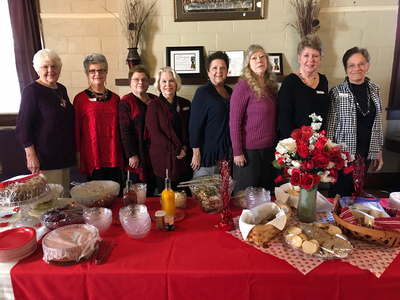 Hostess for the Clifton Forge Woman's Club February meeting.